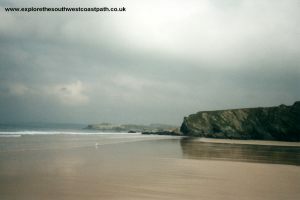 This is an excellent walk, passing fine sandy beaches the whole way from Newquay to Mawgan Porth. 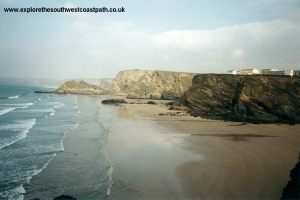 The walk starts from the popular resort of Newquay, passing it's many famous beaches. 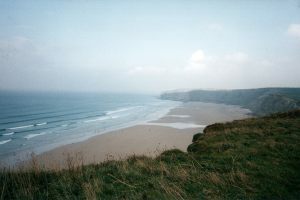 Then onto the large beach at Watergate Bay, popular with surfers and onto the smaller beach at Mawgan Porth. Many of the beaches on the route have seaside awards, making it an ideal walk if you want to spend some time on the beach or go for a swim as well. Newquay is on the A3058, which connects with the A392 which joins the main A30 through Cornwall at Indian Queens. Note that the A30 does get very crowded during the summer months, particularly on the section over Goss Moor and so traffic jams are common. If you are traveling in the peak summer season, especially at weekends, it may be better to choose an alternative route. 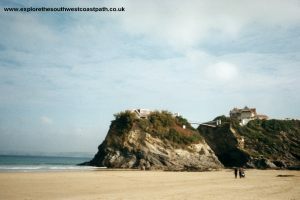 Newquay is fairly easy to get to by public transport. There is a station in Newquay, on a branch line from Par on the main line, though the service is infrequent, running just 4 times a day for most of the year. This makes it fairly useless for walking the coast path, though the service is more frequent during the school summer holidays. Alternatively there are frequent bus services from St Austell, St Columb and Truro, as well as from local towns and villages to Newquay. 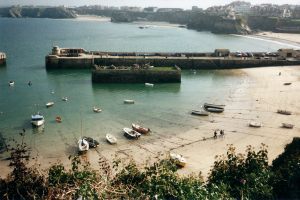 A coastal bus services runs from Padstow to Newquay, via Constantine Bay and Newquay Airport and there are also fairly frequent bus services to Perrnaporth. For more information on these services, see the link below. 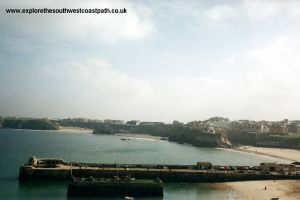 There is a good range of accommodation in Newquay, including self catering. The choice is more limited at Mawgan Porth. 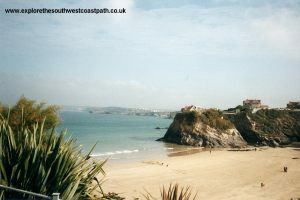 This walk starts in the popular resort of Newquay. Newquay has good facilities and excellent beaches, but the shopping centre and parts of the town centre, are to be blunt, a bit of a dump, consisting of ugly concrete buildings and it also suffers from quite a lot of graffiti. 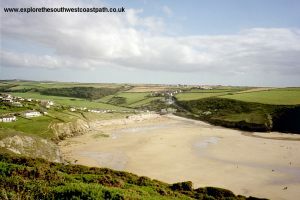 The coast path passes through the town centre and doesn't leave the road until near Tolcarne Beach. However, at low tide it is possible to walk along the sand. The island near the town is an interesting feature of the beach, the house on it is now open in the summer as a tea garden. This section of the coast has excellent beaches, with several caves at the back of the beach. If you decide to stick to the road just follow the main street (avoiding any private hotels etc) keeping the coast to your left and you can't really go wrong. The coast path begins where the grass begins to open up to the left of the road. 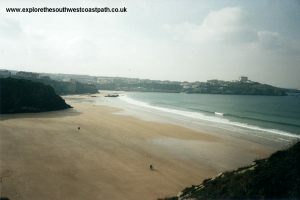 You will pass the Towan, Great Western, Tolcarne and Lusty Glaze beaches on the way out of Newquay, all are excellent. 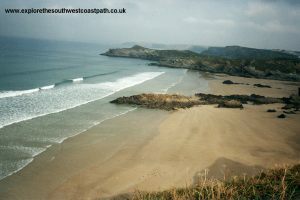 If you stick to the beach, you will need to join the path at Lusty Glaze beach, into Porth beach. This beach is a little more unusual, being very narrow and going a long way back. To cross the stream, if you don't fancy wading through, you will need to get walk to the back of the beach and cross on the bridge there. Porth Island, next to the beach is an interesting headland worth exploring. Some of it is a pitch and putt course. Once round Porth Island, Watergate Bay stretches out before you. This is a very large beach which, given it's size, tends to be quite a bit less crowded than the beaches in Newquay. It is popular with surfers all year round. 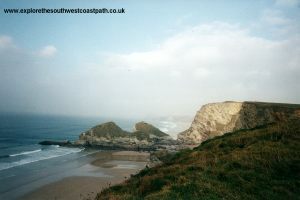 The coast path sticks to the cliff top until the centre of the beach, where it descends into the small village. There is a shop and small cafe, hotel and toilets here. It is not uncommon to have planes flying low overhead, as Newquay Airport, is just a short distance in land, and is also used by the military. After Watergate Bay, the path then climbs back to the cliff top, giving excellent views of the beach and back into Newquay. 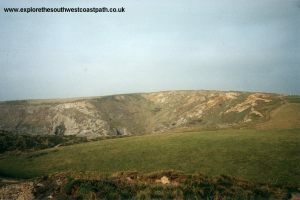 As you pass Watergate Bay, the path does become quite narrow, between the farmland inland and the cliff edge. It was windy when I did the walk, so I certainly noticed how close it is to the cliff edge! 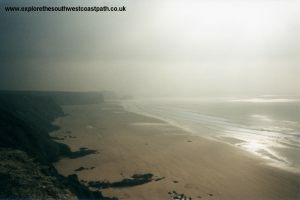 At the top of Watergate Bay, the path rounds Stem Point, Griffins Point and Berryls Point. There are beaches here at low tide. After Berryls Point, you will be in Mawgan Porth. The beach here is, like the others on the walk, excellent although it does get crowded in the summer. Mawgan Porth has plenty of places to get refreshment, as well as limited accommodation. Buses leave from here back to Newquay, but they no longer go from the bus shelter on the main road as you might expect, but from the road from St Mawgan instead, just across the street., this is signed on the bus stop. A timetable and price list should be displayed on the side of the road for the buses to Newquay. The buses now run via Newquay airport, rather than the coast road between Mawgan Porth and Watergate Bay. Although quite a bit more frequent than it used to be, the bus only runs every two hours for much of the day, so you may have a bit of a wait to get back. Western Greyhound operate a bus service between Mawgan Porth and Newquay, running approximately every two hours (including Sundays). As noted above, the bus now departs from the road towards St Mawgan rather than from the bus shelter, though a small map is displayed at the bus shelter in case it isn't clear. The bus now takes an inland route between Mawgan Porth and Watergate Bay, to serve Newquay Airport. Although not especially quick, you will probably be glad of a sit down and rest. Double decker buses are often used on the route, giving good views around the coast. The buses stop at the bus station in Newquay and also pass the rail station. For more information, see the links below, or call 01637 871871. Here are some photos of the walk, in roughly the correct order. Unfortunately, the weather closed in towards the north of Watergate Bay, so I don't have so many pictures of this part of the path. 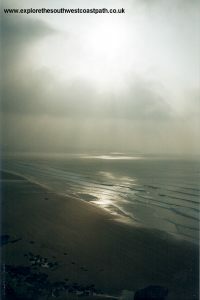 The photos of Mawgan Porth were taken at a later date when I walked there from Trevone. Click each picture for a larger version and description. Ordnance Survey Landranger map 200 covers this area of the coast path and is available from most book shops nationwide. It is also stocked at the Tourist Information centre in Newquay. Streetmap is a web site which provides maps of the UK. 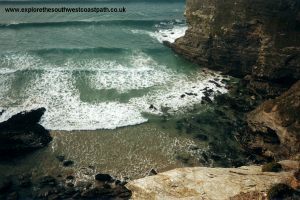 The links below will be of most use to the coast path from Newquay to Mawgan Porth. 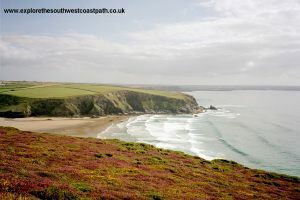 These maps join to provide the complete coast path between Newquay and Mawgan Porth.